Iv San Bernard products are an exclusive line of fine Italian pet spa products. Iv San Bernard was described by European press agencies as a leading company in the pet field in quality, design and marketing. They are the top-selling pet grooming products in Europe and Asia now available in the United States! This is a product unlike any you have seen before. Iv San Bernard, founded in 1995, is the leading European manufacturer of animal care products from Italy. ISB produces an array of products designed for various coat types and proper skin management with all products based on natural ingredients. Special attention to the skin, hair and health of the animals through proper product use, selection, technical support and training are ISB’s core attributes. Iv San Bernard’s mandate to its grooming customers is to provide them with product, technical support and marketing support which will make them stand out from the rest. Because of this approach, ISB is now distributed in over 35 countries (including Canada, USA, Mexico, Japan, China, Taiwan, Hong Kong, Singapore, Indonesia, Uruguay, Brazil, Saudi Arabia, Malta, many European countries, and Russia) and has changed the way in which we look at and consider the profession of grooming. ISB provides products that will improve the end results of the groom thus improving overall customer satisfaction. Iv San Bernard, USA is owned and operated by Cliff Faver, DVM where we not only align with the mission of our Italian founder, but also place a special emphasis on education. We teach the Science of Skin & Hair thereby enabling our customers to understand how and why our products work. Our professional expertise allows us to provide solutions to all skin and coat issues from hamsters to horses and we encourage our customers to take their knowledge to another level and become an expert too. We have created a culture of respect for ideas and creativity, kindness, fairness and fun, where we all work together to improve the health of animals. Not only is Iv San Bernard USA’s managing partner a licensed veterinarian, we also have a Certified Pet Aesthetician, and Certified Veterinary Technician, as well as others with experience in the grooming industry at your disposal. Unsure how to use a product? Call our Certified Pet Aesthetician and Product Consultant for help. Read more about our staff here. 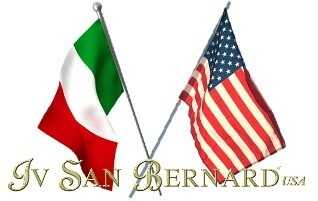 Visit the Italian Home Site Here. ISB supports the humane and ethical treatment of all animals.